The vehicle specific LED replacement assemblies directly replaces the stock license plate lamp, the side door courtesy lamp and the side marker lamps for a 100% more lighting output. Instead of just replacing a bulb inside, we have redesigned and used up the entire space inside a lamp to build with an LED circuit board so it can easily achieve a 3-4 times more lighting output than a stock bulb and at least two times brighter than a simple LED bulb replacement, with a more OEM look. 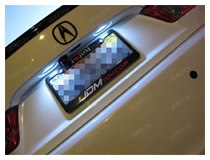 Take a look at this picture of the LED license plate lamp, there's a smaller tab and a bigger tab. Please push down on the spring loaded tab until you hear the click sound, and then slide the license plate in the opposite direction to lock. OEM fit LED assemblies are specially designed to be installed directly onto a vehicle and make it look like the car originally came from the factory with those LED lights. 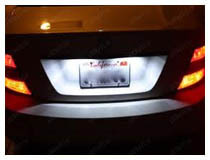 There are many kinds of OEM replacement LED assemblies, including OEM fit LED license plate lights, Direct Fit LED Side Marker Lights, LED turn signal lamps, and much more. OEM fit LED assemblies are available for a number of vehicles, including Audi, BMW, Lexus, Porsche, MINI Cooper, Scion, Toyota, Honda, and much more so you can give your car a classy, complete, factory-style LED look. 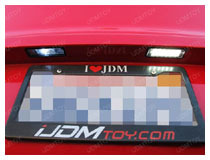 Here at iJDMTOY, we carry the most comprehensive collection of OEM Fit LED lamps for almost all vehicles. 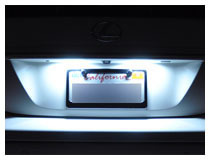 Try out our direct fit LED license plate lamps to illuminate your license plate like you’ve never seen before or the OEM style LED side marker lamps to upgrade your stock side marker to LED. 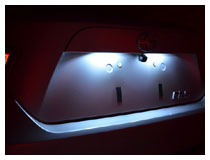 OEM Fit LED lights allow your car to look classy, while still maintaining the aura of the car. 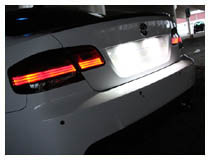 If you have any questions on which OEM fit LED light fits your vehicle, our LED lighting specialists will be more than happy to assist you in picking out the correct LED assembly for your car. Since we are car enthusiasts ourselves, we understand how important it is to make your car look great and still keep the factory look.